Roughly half of pregnancies among adolescents aged 15–19 in developing regions are unintended,1 and about half of these end in abortions,2–8 most of which are unsafe. Among the 253 million women aged 15–19 in developing regions, 14% (36 million) need contraception because they are married, or are unmarried and sexually active, and do not want a child for at least two years. Of these 36 million adolescents, 43% (16 million) are using modern contraceptives. The most common methods are male condoms and the pill, followed by injectables. The other 57% (20 million) are not using a modern method; these adolescent women have an unmet need for modern contraception. Among these women, 85% are using no method at all, and the remainder use traditional methods, which are less effective than modern methods. In Africa and Asia, nearly two-thirds (62% and 64%, respectively) of sexually active adolescents wanting to avoid pregnancy experience unmet need. In Latin America and the Caribbean, that proportion is 38%. Based on 2017 estimates, the annual cost of providing contraceptive services to the 16 million women aged 15–19 who currently use modern contraceptives is $276 million. If services were improved for the 16 million adolescent women currently using modern contraceptives, costs would increase from $276 million to $417 million. Examples of improvements that would benefit adolescents include better contraceptive counseling and follow-up, consistent availability of a range of modern methods and providers who are trained to work with adolescents. If the 20 million adolescent women with unmet need were to use the same mix of modern methods as current users and receive improved services, total costs for current and new users would be $889 million each year, an increase of $613 million annually. A large portion of the cost increase ($379 million out of $613 million) would be for Africa because much unmet need is concentrated in this region, and health systems there are greatly in need of strengthening. The annual cost per user would average $25 for developing regions as a whole, ranging from $15 in Asia to $27 in Latin America and the Caribbean and $35 in Africa. Put differently, the annual cost per capita in developing regions would be 14 cents. If all adolescent women who need modern contraceptives were to use them, unintended pregnancies would decrease by six million per year (63%), and total pregnancies would decrease from 20 million to 14 million. This would result in 2.4 million fewer unplanned births; 2.9 million fewer abortions, of which 1.9 million would have been unsafe; and 763,000 fewer miscarriages and stillbirths from unintended pregnancies. Maternal deaths—those due to complications of pregnancy and childbearing—among women aged 15–19 would drop by 6,000 from the current level of 28,000 per year10 to 22,000. Most of the deaths averted would be in Africa (4,300), the region with the world’s highest maternal mortality. Engaging young men in sexual and reproductive health programs can also help bring about more gender-equitable attitudes. Adolescents need access to medically accurate and complete sexual and reproductive health information before they are sexually active. This information should be age-, developmentally and culturally appropriate. Policies and programs, including comprehensive sexuality education, should be put in place to address this need. 3. Izugbara C et al., Incidence and Complications of Unsafe Abortion in Kenya: Key Findings of a National Study, Nairobi, Kenya: Ministry of Health, Government of Kenya, 2013, https://www.guttmacher.org/sites/default/files/report_pdf/abortion-in-kenya.pdf. 4. United Nations Department of Economic and Social Affairs, 2016 United Nations Demographic Yearbook, 2017, Table 14, https://unstats.un.org/unsd/demographic-social/products/dyb/dybsets/2016.pdf. 5. United Nations Department of Economic and Social Affairs, 2015 United Nations Demographic Yearbook, 2016, Table 14, https://unstats.un.org/unsd/demographic-social/products/dyb/dybsets/2015.pdf. 6. Juárez F et al., Embarazo no planeado y aborto inducido en México: causas y consecuencias, New York: Guttmacher Institute, 2013, https://www.guttmacher.org/es/report/embarazo-no-planeado-y-aborto-inducido-en-mexico-causas-y-consecuencias. 9. 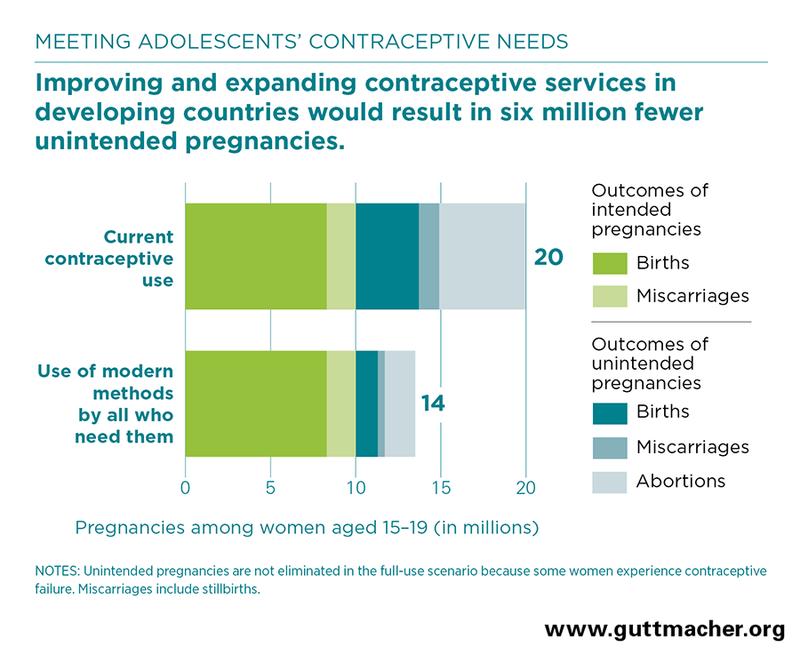 Sedgh G, Ashford LS and Hussain R, Unmet Need for Contraception in Developing Countries: Examining Women’s Reasons for Not Using a Method, New York: Guttmacher Institute, 2016, https://www.guttmacher.org/sites/default/files/report_pdf/unmet-need-for-contraception-in-developing-countries-report.pdf.